A number of infected Google Play Store apps have been discovered by security experts and were capable of stealing your pictures. Android users are being warned about a sinister secret a number of Google Play Store apps have been hiding. Security experts Trend Micro have put out a warning about dozens of Android apps that were found on the Google Play Store. These nefarious Android apps posed as ‘beauty camera’ programs, but held a much more sinister motive. The malicious apps pushed adverts onto infected devices with fraudulent and pornographic content as well as redirecting users to phishing websites. These apps were downloaded millions of times, and some of them even collected selfies taken on infected devices which sent to servers elsewhere. 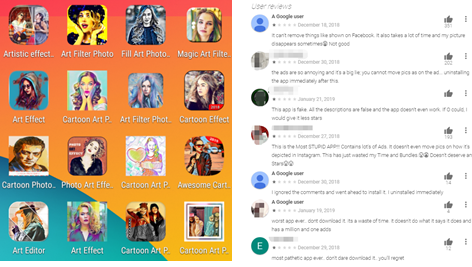 “Further investigation led to another batch of photo filter-related apps that share similar behavior on Google Play. 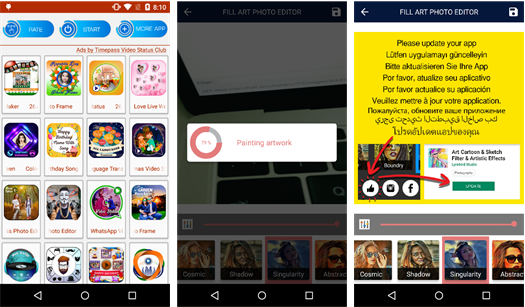 “These apps seemingly allow users to ‘beautify’ their pictures by uploading them to the designated server. However, instead of getting a final result with the edited photo, the user gets a picture with a fake update prompt in nine different languages. These apps found on the Google Play Store also evaded users trying to uninstall them by hiding from the application list after getting installed. Trend Micro said a large number of the installs for these malicious apps originated in Asia – particularly in India. The apps have now been removed from the Google Play Store. If you’re wondering whether you have any of these malicious apps on your phone, head to this post from Trend Micro to find a full list of the nefarious apps.